This unique townhouse is located in the action of historic 25th street and the old Union Rail Station. Nearby there are many fine restaurants and taverns like Union Grill, Jasohs, Artisan Grille, Tona Sushi, Roosters Brewing Company, Bistro 258, Athenian Greek, Great Harvest Bread, Sonora Grill (Mexican), Iggy's Sports Grill. Located a block from the new Ogden Junction with many new resturants and Soloman Center, complete with I- Fly air tunnel sky diving, flow rider water park, bowling and Fat Cats Arcade with billards, bumper cars and pool tables, Golds Gym and a 13 megaplex movie theater with reserved seating. Also in the Junction is the Treehouse Childrens Museum.There are many fine art studios with a short walk. The townhouse is decorated with many panoramic images by a very well known and accomplished artist photographer Richard Caldwell. The New York Times, Wallstreet Journal, Ski Magazine, Sunset Magazine, Forbes and many other publications have called Ogden one the top ten places to visit. Alpine Skiing and Snowboarding: With Snowbasin, Powder Mountain and Wolf Mountain you are minutes from some of Utah's great resorts with exceptional value and the "Greatest Snow On Earth"
Snowbasin $64 - Powder Mountain $58 - Wolf Mountain $35 described as one of the best learning mountains in the United States. Discount tickets can be purchesed at Alpine Sports, 1165 Patterson. Iam retired cargo ship Captain, with a wide range of work experience all around the World. I consider my passions to be sailing and skiing. I race sail boats locally and internationally. I enjoy skiing in USA as well as in Europe. While in high school, I skied with the "KS Kolejarz" Ski Club. The first time I skied in Utah was during the Olympic Games in 2002. I foung skiing here to be extremely exhilarating and rewarding experience and was especially awed by the tremendous mountains. I belive that snow in Utah is by far the best in the world. I found that skiing the Snowbasin and Powder Mountain with Helicopter skiing is a fatastic and memorable experience for all your life. The Townhouse is located in the middle of 25th St which is a historic center of Ogden with walking gate to gated property right from 25th St and driving gates from Wall Ave and Lincoln Ave. After ski this unique location gives you the opportunity to explore fine antique shops, excellent dining, exhibitions, museums, Aqua Park and Cinemas. Stunning views of the Wasatch Mountains rising out of the City of Ogden. Qwest1488 is your WiFi connection. Clean, comfortable, great location. Perfect for the needs of four skiers. Beware! Lower level has no heat. There is an electric fireplace, but if you run it the breakers will blow. Had to resort to a small electric heater - a real joke. The VRBO listing claim this unit has cable/satellite tv available. This is false!!! The tv system is a smart tv but was very challenging to figure out. Especially when the remote control didn’t have any batteries. Also. There was some sort of antenna system, that’s right antenna. Problem is signal wasn’t strong enough to actually watch anything. Finally, be aware parking is very challenging. If you have a larger vehicle, the garage is small. Then there are only 2 visitor parking spots available for this entire complex which are always full. Oh yeah, I contacted the owner/manager of the property. Basically didn’t provide any resolution to any of the issues. We did not receive access codes to the condo until late at night on the day of check in. The owner's contact info on VRBO was not correct. The heater did not work the first night so it was very cold inside. The property and furniture are modest but not too bad. Right smack where you want to be in Odgen! We had a great stay! Packed in 11 people, ages 5 to 92, and accommodated everyone very well. The kiddos loved turning the third floor into a playroom and sleeping under the skylight. The kitchen is clean and well stocked with dishes, a full washer and dryer available and it's pretty quiet. Loved the location!! This is our favorite area to stay at, right off of Union Station, small business shops and restaurants. There is also a playground about 4 blocks away. Thanks so much for having us. We would rent this place again! This townhome is a little hard to find if you're not familiar with the area. However the owner does help you. It has plenty of beds to accommodate everyone. It's location has great proximity to things to do. There was a farmer's market on Sunday just steps away from the property. We also walked to a minor league baseball game and the train museum. We had a great time visiting family in the area. We stayed here over the 4th of July week. The place is located right off of Historic 25th in Ogden, so lots of shopping, restaurants and bars. We were able to go to the farmers market, which is a big deal in this area. 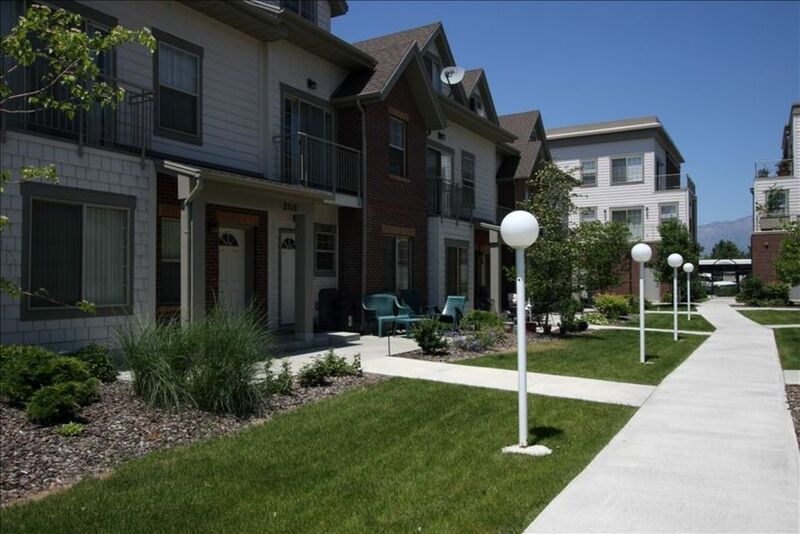 The town home is also close distance to major attractions and the mountain. The town home had plenty of room for our family of 6 (4 adults and 2 children). The town home was clean and well stocked with towels and dishes. Please note that the advertised price is not what you could get the host did a price adjustment and it was increased $30 more a day with added fees. Also please note that there is no cable/satellite (even though it is advertised). The town home did have a smart TV in the living area with HD antenna and DVD. The smart TV did have Netflix/hulu only if you have an account could you access it. There was a TV in one of the bedrooms on the second floor with HD antenna and DVD. We brought our fire stick from home so the kids were entertained in the evening for the most part. We were gone most of the day and the central air would shut off so it would be 80-85 degrees when we would get back in the evening. We were mostly using the place to sleep. We had rented a large SUV and unfortunately due to the location of the garage we were unable to park in the garage. There are two visitor parking spots and it is a first come first serve basis. For the most part we had a place to park except one day we had to park on the street and wait until a visitor spot opened. This was a last minute rental due to our original rental fell through 7 days before our trip. I gave 4 stars due to host advertised $71 but made adjustments and it was much more then advertised. We rented the place due to location. Overall it was a nice place and in a good location. "Ogden Raptors Minor Leage Baseball, Eccles Conference Center, Weber State University, Hill Airforce Base & Museum"